Apple is likely to see modest gains in iPhone sales in the medium term thanks to early smartphone upgrade programs from major U.S. wireless carriers, one analyst has projected. 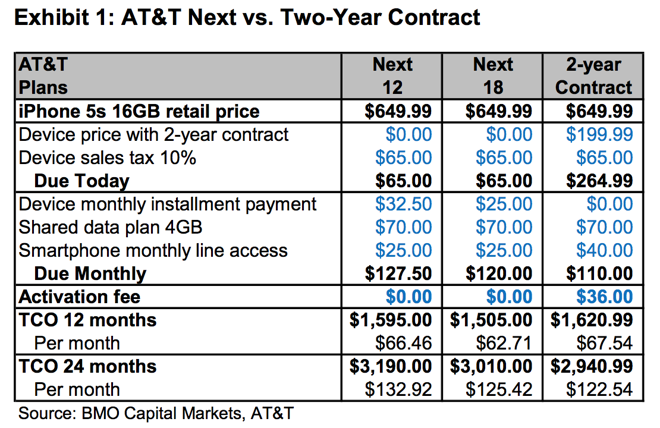 Keith Bachman of BMO Capital Markets issued a note to investors on Thursday, a copy of which was provided to AppleInsider, in which he took a closer look at the early upgrade programs from America's two largest wireless providers: AT&T Next and Verizon Edge. Both plans allow users to upgrade their devices more frequently than every two years, by paying for a new device with monthly installment payments. In his view, both plans are attractive to subscribers who may want to upgrade to new devices every year, and he believes these plans could represent more than 20 percent of subscribers by the end of this year. If his prediction comes true, Bachman believes it could net Apple an additional 5 million iPhone sales in fiscal year 2014. At an average selling price of $730 among early adopters, Bachman said that would translate to around $3.7 billion of revenue. Bachman sees AT&T Next and Verizon edge as "modest positives" for Apple, as they shorten users' replacement cycles for buying new iPhones. But those sales would be "pull in from future periods," rather than new iPhone users. Those predictions may not be as aggressive as some might think, as AT&T indicated that 15 percent of its smartphone customers had already opted in to the company's Next program as of the December 2013 quarter. Bachman's forecast calls for as much as 25 percent of all smartphone users to be on AT&T and Verizon's early upgrade programs by the end of this year. By increasing the turnover speed of new smartphone purchases, such programs will also result in more refurbished iPhones being available for sale on the market. Bachman believes a majority of those used handsets will be sold overseas. While he doesn't believe those trade-ins will hurt sales in the U.S., it could have an affect on developing markets, where customers tend to prefer cheaper phones and prepaid plans. As for the longer term effect of AT&T Next and Verizon Edge, Bachman said they could present challenges for unit growth in the longer term. 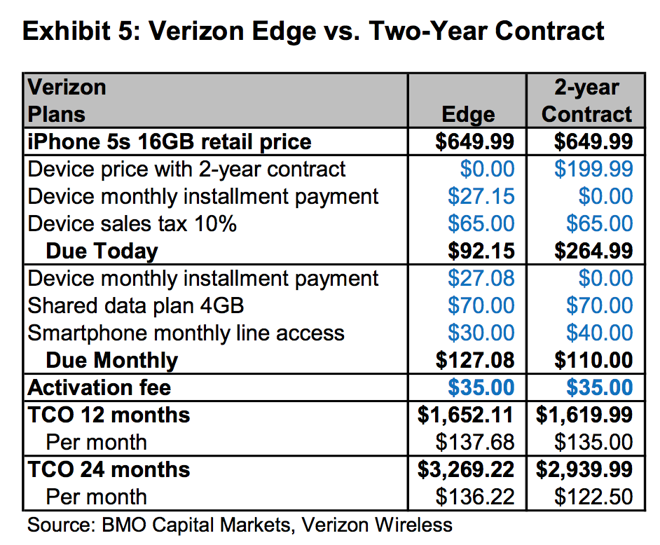 That's because carriers are looking to put the cost of upgrades on consumers up front, which may make some other, less enthusiastic smartphone buyers reluctant to upgrade as frequently as the current two-year upgrade cycle subsidies allow them to do. 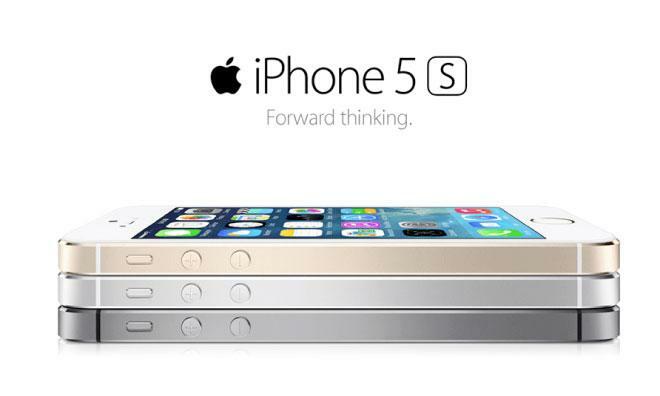 BMO has maintained its "outperform" rating for AAPL stock with a price target of $565.